Can you believe it's Christmas Eve?! It seems like it was Thanksgiving just yesterday! Wow the month has flown by! One good thing for me is I don't have to go out and brave those crazy crowds today! I finished the last of my shopping yesterday morning before things got crowded. Today, I just have to do a little wrapping, and then it's baking and watching holiday movies with the family. Tonight, we'll eat dinner at our new table; Chinese food. Yum! Whatever you're doing today, whether it's running around town for that last minute gift, or prepping for tomorrow's big meal, or maybe Christmas isn't your things, and it's just like any other day, whatever you're doing... Enjoy the day, and fill it with happiness and MUSIC! It's MUSIC MONDAY!! Before we get to Christmas songs for the day, here's a great new song from Dropkick Murphy's from their upcoming new album. For many of us with tattoos, each one tells a story. My husband just got his rose tattoo finished with a crown above it for our daughters. The pocket watches show their birth times and the crown and rose symbolize their names. Here's "Rose Tattoo". Now, onto some songs for the holiday. This is one from Rod Stewart, "Let it Snow." There are many great remakes to "Santa Baby" but I still like the Eartha Kitt one the best. Ave Maria has to be my favorite Christmas songs because it is just so beautiful. Here's a different take on it by Chris Cornell...and in english. Warning there is a t least 1 F Bomb in this so be careful around children! Have a fabulous and musical Christmas Eve! I think everyone has someone that is difficult to shop for because they tend to buy themselves whatever they want. For me, that person is my Gramma. I used to really struggle with what to get her until I realized it truly is more about the thought of the gift. I no longer struggle with trying to out do myself from the year before. I just always order her fruit. She loves it, and it makes it simple for me. I just have to find the best fruit deal of the year, and that's what I go with. 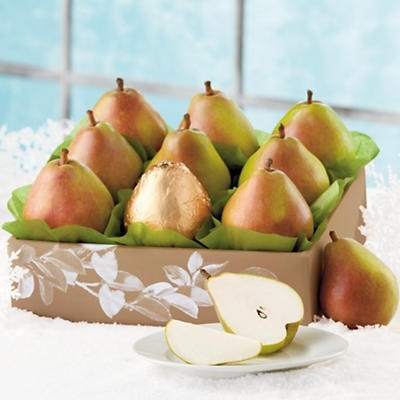 This year it's this great deal on pears at Harry and David. 5lbs of Royal Riviera Pears is normally $29.95 but it is 40% off for $17.96 use code SHIPJOY for Free shipping and use ebates to get 10% cash back! Now Gramma will be happy and so will my wallet! Hurry, today is the last day to order to guarantee Christmas Delivery! Happy Music Monday! It's the first Music Monday of December, and what better way to kick off the month than with Holiday music?! This week is some of my favorite music from animated Christmas shows. Have a happy and music filled week! Here's a sweet new sweepstakes. Starting today through 12/21, Haribo will be giving away all of our favorite little candies including those yummy little gummi bears! 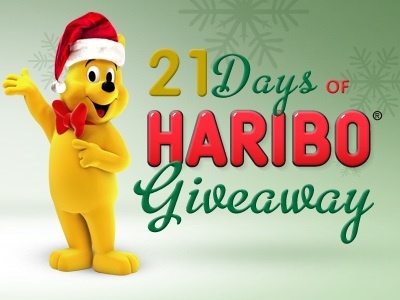 There will be multiple winners daily with almost 250 prizes total. Let me know if you win, because that's something to sing about!